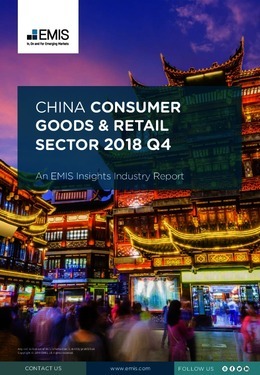 In Q3 2018, total retail sales of consumer goods in China rose by 3.8% y/y to RMB 9,428bn, following a 3.7% y/y increase in Q2. Higher retail sales were fuelled by rising incomes and higher consumption expenditure per capita, which rose by 7.9% y/ y to RMB 4,672. In the first nine months of 2018, China’s domestic consumption contributed 78% to the country’s economic growth, up by 14 pp y/y. Sales in rural areas rose by 5.1% y/y to RMB 1,366bn and those in the urban regions were RMB 8,063bn, up by 3.6% y/y. The retail sector was restrained by a decline in car sales, which slid by 9.9% to RMB 970bn. In terms of retail formats, large scale physical retailers including hypermarkets, supermarkets, and convenience stores registered a 2.6% y/y growth in sales in Q3 2018. Sales in the supermarket segment alone increased by 5% y/y due to increased traffic and basket value - a result of the implementation of new-retail strategies and technology-enhanced shopping experience. This report provides a complete and detailed analysis of the consumer goods and retail sector for China. EMIS Insights presents in-depth business intelligence in a standard format across countries and regions, providing a balanced mix between analysis and data. Build a clear picture of sales and market share for different retail channels (e.g. department stores, hypermarkets and e-commerce).